The answer is a resounding, ‘Stand with no effort and do not TRY and do anything!’ The minute you do, you are imitating a good posture and using muscles to do so…so you will get tired and stiff and tension will go up in your body. Not something we are aiming for right? What we aim for at Spirohealth with ABC is to get your posture corrected and you stand up straight because it just is good, rather than you making any effort. When you work against your body it creates resistance and tension. Glynis here was completely relaxed in both pictures, can you believe it? 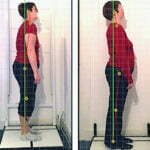 This entry was posted in Chiropractor, Client Authored, General Health, Uncategorized and tagged ABC, posture, Spirohealth.